Lamborghini Diablo SV (Super Veloce) was introduced in 1995 at Geneva Motor Show and was the first to revive the "super veloce" initials first used on the Miura. 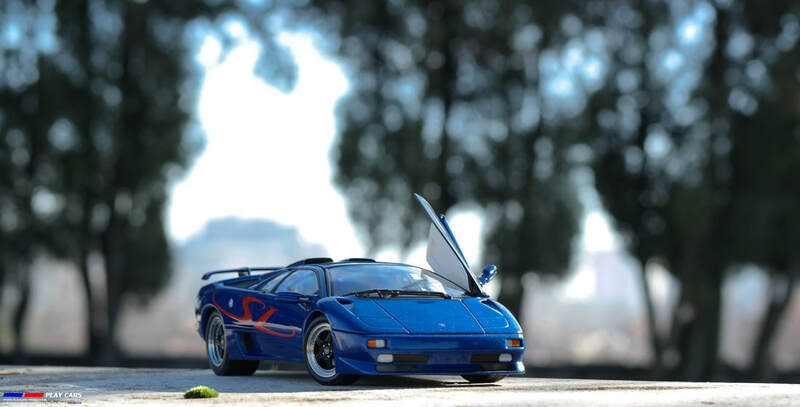 Was based on the standard Diablo, but with a notable power increase and the lacking of the four wheel drive from the VT, together with some exterior modification and bigger brakes. 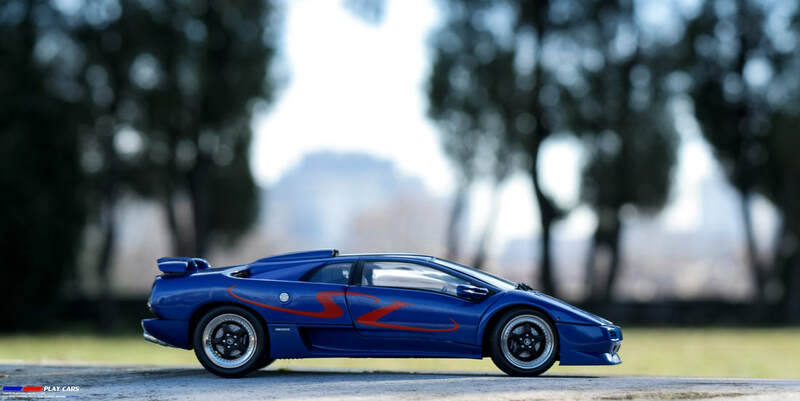 As a curious fact, the SV was listed as an entry model on the Lamborghini lists, even if the price was considerably high and the rear wheels traction combined with the huge amount of power transformed it in a scary car, when was used unwisely. 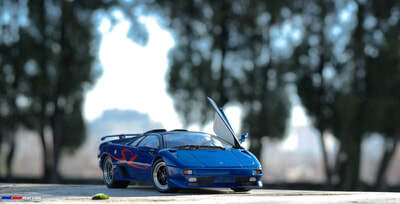 For many, this SV version is considered to be the last Diablo ever built. Lamborghini Diablo SV is a part of the first generation of models released by AutoArt, having almost 8 years old when I’m writing this article. 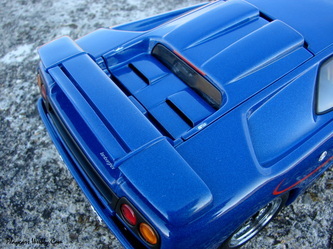 At this moment is the single reproduction in 1:18 scale and the first impression is in line with the expectation. Its out of date design for this early period of the super cars was surprised very well by the manufacturer, the model following precisely the aerodynamic and aggressive lines of the real car. 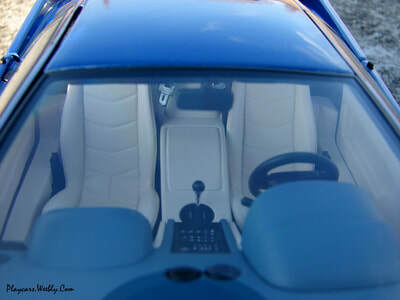 The model results heavy, despite the fact that the bumpers are made of plastic, the gaps between the parts are minimal, only the doors are feeling not stable just because of the fragile hinges. On the entire body the paint job is very well done, in a perfect applied layer with metallic flakes for an amazing effect in the strong light. The big SV logo is also painted. 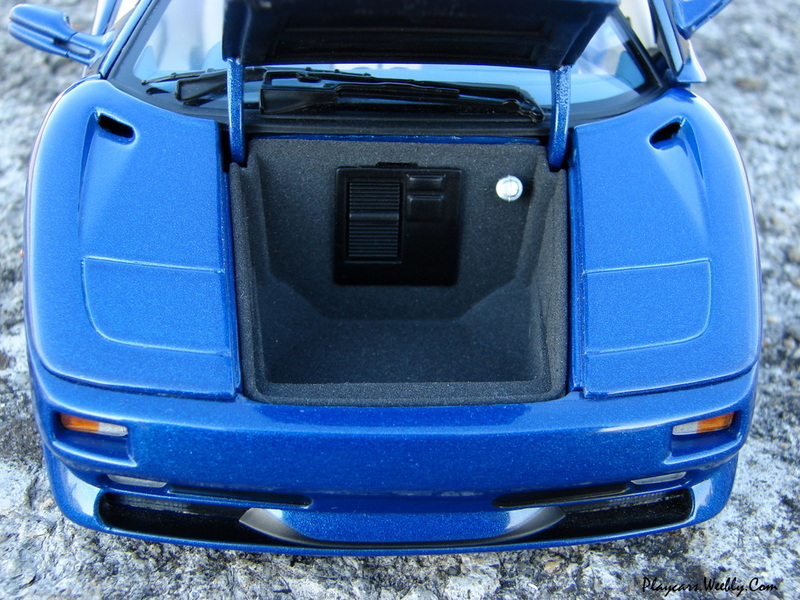 The most distinctive part of the real car and a symbol for the 90's performance cars, the pop-up lights are not functional unfortunately, despite this fact our replica provides realistic made turn and rear lights. All the badges are tampo applied, only on the back side, the car lettering and model are represented by two individual badges. 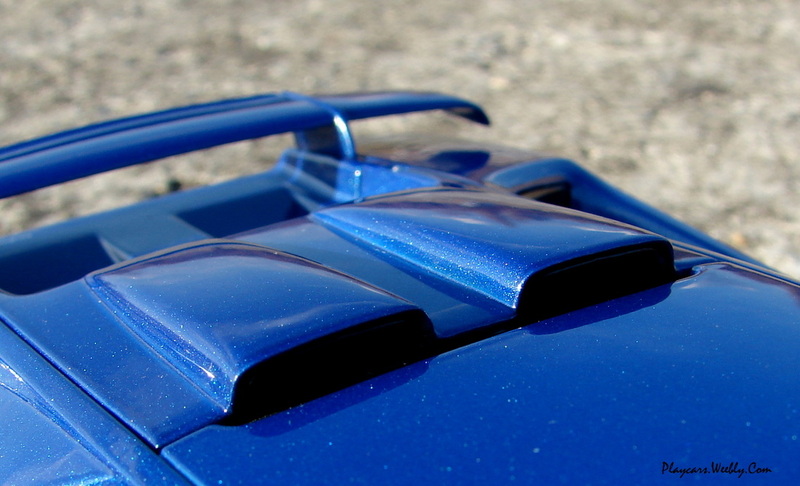 The model doesn't provide real grills for the air vents, we have only two textured and transparent pieces to remember them, around the engine bay. Still from the exterior, I'll mention the final pipes of the exhaust system, beautiful chromed as a pleasant thing and the not so inspired turn signals on the fenders replicated by two painted points. Taking a look on the wheels I have once again the confirmation that they do an excellent job. The rims keeps perfectly chromed lips and black spokes marked with the Super Veloce initials and the Lamborghini logo in the center. All the details were very good scaled, the rivets and the separate silver painted struts looking very realistic. Behind, the brake system was detailed in the same high level, with dimpled disks and "Brembo" calipers. The huge tires have the right profile and a soft, realistic texture. Very nice work here! In fact all the exterior looks amazing for the model's age. The scissors doors are opening by acting a button, an attempt to play the real car mechanism. But, everything will transform quickly in a big fail, or at least in this case, because the doors will refuse to open as long as you push that button and if eventually you'll succeed, the doors won't remain open as they should. 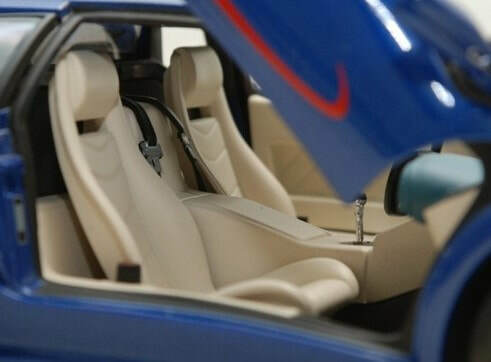 Once this attempt was made, is easy to observe the sportive and simple interior built just like the real car. 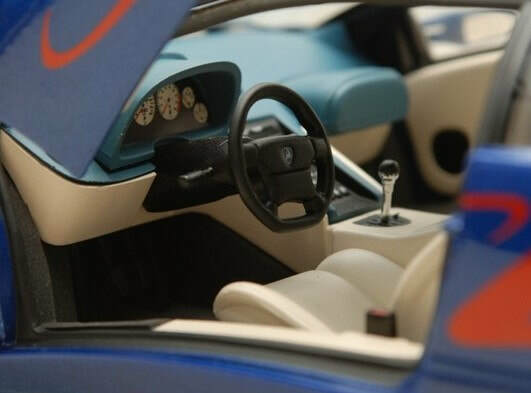 The interior is well finished, the seats and steering wheel are looking good, the central console was detailed with a lot of buttons, each of which being inscribed, the air vents are cut through and the indicators are replicated by legible stickers. The entire surface of the floor is covered in a textured material. Both lids are functional and the one in the back reveals the V12 unit, detailed by some separate pieces and inscriptions and still visible from the underneath. 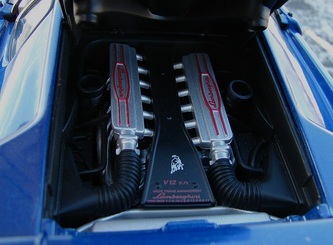 In the same time keeps cut through air vents and a shy attempt to replicate the safety clamps. In the front compartment is visible a part of the ventilation system and the same textured surface around it. 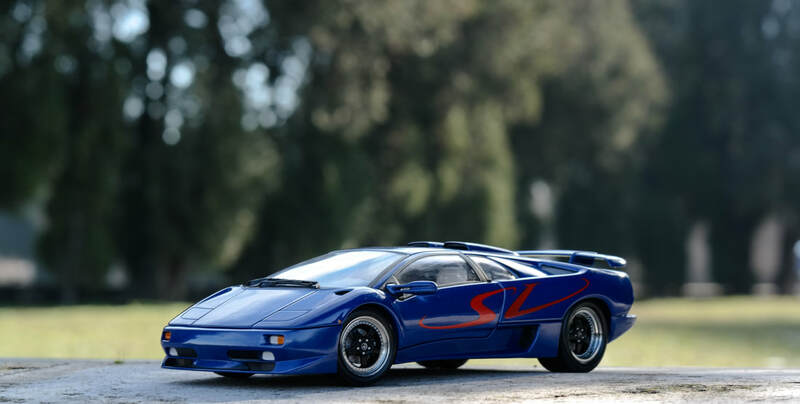 Being one of the early Autoart's releases the Diablo SV doesn't show its age and remains the best replica of the famous "Devil" you can expose in your collection. Is beautiful almost as the real car is, nice done, without imperfections giving something more than you would have expected. The paint job and the wheel's details amazed me, the contrast between colors on my model is very inspired and I still think that this is the best option. 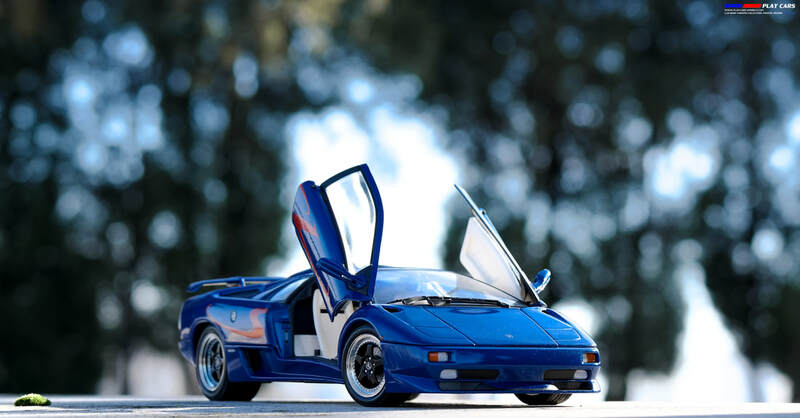 The Diablo SV is the model which stands out from my Lamborghini line and in spite of the newer ones is the most valuable of all.